Photographer Jeffrey Berkes took the image over the Florida Keys in 2012. 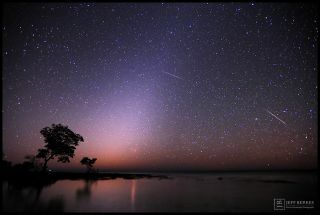 The ghostly zodiacal light offers an ethereal glow to this stunning night sky scene peppered by meteors as seen by a veteran night sky photographer during a trip to Florida. Photographer Jeffrey Berkes captured this striking night sky view while visiting the Florida Keys in 2012 and recently shared it with Space.com. The luminous cloud of dust is a faint glow caused by millions of tiny particles along the ecliptic, the path of the sun and planets across the sky, which ancient astronomers called the zodiac. Meteors from the annual Quadrantid meteor shower - which typically peaks in early January - also shine in this image.